Rev. Ike Reveals the Techniques for Getting Your Prayers Answered! Rev. 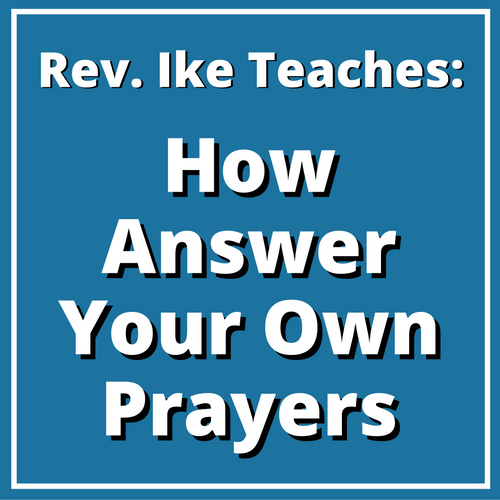 Ike’s full-length MP3 lesson, “How to Answer Your Own Prayers,” is going to turn upside down some of your ideas about praying. It’s going to reveal to you a whole new definition of PRAYER and teach you his powerful techniques that you will use to GET YOUR PRAYERS ANSWERED! Who Really Answers Your Prayer? …but prayer is heard and answered by God-in-you. As the foundation for this lesson, Rev. Ike recounts the miraculous Bible story about the woman healed of her 12 year ‘issue of blood’ when she touched the hem of Jesus’ garment. He interprets this story from a Mind Science point of view — to reveal the secrets behind the miracle — and the techniques the woman used to answer her own prayer for healing! Rev. Ike goes on to explain the importance of faith/belief — the idea of accepting the answer to your prayer — and how it works by impressing your subconscious mind. And he teaches you how to use FEELING when you pray — how you must evoke the feeling that you ALREADY HAVE THAT for which you are praying! This is a 26-minute, participatory lesson – giving you lots of opportunity to repeat powerful affirmations with Rev. Ike — that will impress these ideas and beliefs deep in your mind and invoke the feeling and excitement of success and prosperity in your consciousness. You’ll practice with Rev. 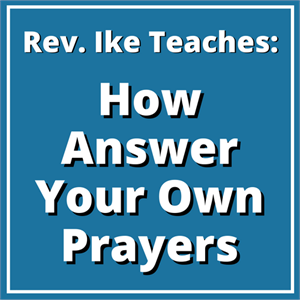 Ike the correct manner for receiving the answer to your prayer! …so you will know How to Answer Your Own Prayer! Since this powerful, eye-opening audio lesson is somewhat shorter than usual (about 26 minutes long) we’re offering it at a special low price of only $2.95! Having this lesson on MP3 is like having Rev. Ike with you, teaching you, coaching you and inspiring you — all at your command! And at only $2.95, it’s a terrific bargain – so order now for immediate download!